12/6/14 UPDATE: This was originally posted on 8/27/14, but I want to continue to be able to use it as a resource to share with anyone who wants to get involved with activism around police brutality here in the Twin Cities. Scroll down for a list of links, resources, and organizations (like Black Lives Matter Minneapolis) and feel free to add more! While rallies, marches, social media campaigns and protests can be powerful, their power can only be fully realized when tied to long term organizing campaigns. How can we focus the heightened awareness around police brutality into concrete policy change (like, for example, police body cameras)? How can we plug people who have been radicalized (or at least further politicized) by #Ferguson in to the work that is being done? How can we turn this moment into a movement? What follows is a collection of interviews, links and resources for anyone in our community who believes that change is needed. Racially-motivated police brutality is a national issue, but from Fong Lee to Terrance Franklin to Al Flowers and beyond, it is also very much a local one. The good news is that we can do something about it. As mentioned, events alone don’t magically create change. But rallies, marches, protests, benefits, vigils, etc. are rallying points, places for like-minded people to come together. On a more abstract level, they’re about drawing inspiration from collective strength, as well as spreading awareness and getting media attention; on a more concrete level, they’re about getting people connected—they’re entry points into organizing. Regardless of how you feel about the power of protests, these events are where you’re going to meet the people doing the work. Thursday, August 28, 2014: Solidarity Rally for Mike Brown and All Victims of Police Brutality; organized by the Young People’s Freedom and Justice Party. 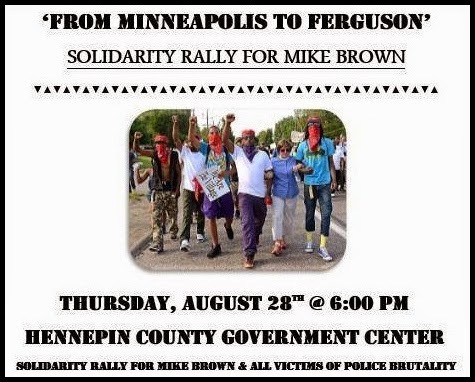 6pm at the Hennepin County Government Center in downtown Minneapolis (300 6th St. S.). There’s also a solidarity event in Duluth at the same time. 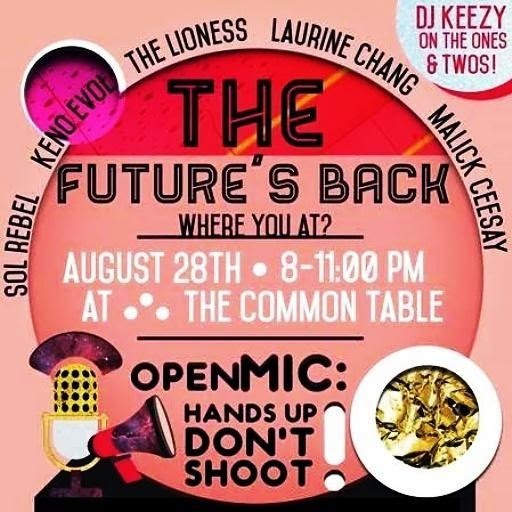 Thursday, August 28, 2014: “The Future’s Back” open mic and solidarity gathering; organized by Neighborhoods Organizing for Change (NOC), MPIRG and the Common Table, and featuring artists Keno Evol, Sol Rebel, Laurine Chang, The Lioness and Malick Ceesay. 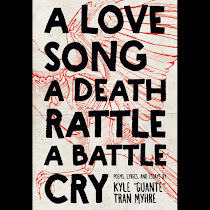 8pm at the Common Table (2001 Riverside Ave.) in Minneapolis. Thursday, September 4, 2014: Follow-up meeting to the National Moment of Silence #NMOS14 Twin Cities; this event will be a space to discuss “next steps for action, both locally and nationally,” while also making the connections between police brutality and the larger reality of the prison industrial complex, mass imprisonment, the school-to-prison pipeline and more. 5:30pm at the Minneapolis Urban League (2100 Plymouth Ave. N.). Thursday, September 4, 2014: Unchain Our Children; a Community Affair; a workshop and community dialogue on the school-to-prison pipeline and St. Paul public schools organized by the NAACP St. Paul youth and collegiate branch. 6:30pm at the NAACP St. Paul youth headquarters (781 Selby Ave., St. Paul). Facebook event page link. Saturday, September 6, 2014: Global Call to Action called by Feminista Jones, who organized the National Moment of Silence. Follow the hashtag on Twitter at #Sept6CTA. (UPDATE: at the rally tonight, they mentioned that the Young People's Freedom and Justice party would be having a planning meeting to keep things moving on this date at the MPLS Urban League; "Community Forum: Reporting Back from Ferguson"). While I always encourage people to attend events, I also want to encourage organizations to make sure they have concrete pathways to getting more people involved. The energy at a protest can be incredibly powerful; it’s the organizers’ responsibility to find a way to bottle it, to turn that outrage into action. One of the most effective ways an individual can create change is by joining an existing organization and bringing their strengths, passions and resources to the table. CUAPB is a local organization explicitly devoted to confronting and dismantling police brutality. For those who may not know, what is CUAPB's mission, and what kind of work are you doing right now? Communities United Against Police Brutality was created in December 2000 to deal with police brutality on an ongoing basis. We work on the day-to-day abuses as well as taking on the more extreme cases. Our overriding goal is to create a climate of resistance to abuse of authority by police organizations and to empower local people with a structure that can take on police brutality and actually bring it to an end. We provide support and advocacy for survivors of police brutality and families of victims so they can reclaim their dignity and join the struggle to end police brutality. We engage in political actions and litigation to change the underlying conditions that lead to police brutality, misconduct and abuse of authority. We educate the community on their rights and on policing issues. Our hotline continues to receive far more calls than Internal Affairs and the police complaint agency combined. We organize copwatch to document police conduct in the street and courtwatch to document judicial conduct and ensure people receive fair trials. Most recently, we’ve been working on a ballot measure that would require Minneapolis police to carry their own professional liability insurance. The city would pay the base rate for the coverage but officers would pay any additional premiums based on their complaint and claims history. Just as bad drivers pay higher premiums for their insurance, bad cops would pay more and some would eventually become uninsurable. Besides providing individual consequences for misconduct, this measure would save the taxpayers millions in judgments and settlements we now pay for bad policing. There has been a lot of anger, a lot of grief, and a lot of pain over police brutality recently. What are some ways people might focus their outrage into action? Are there ways someone reading this could plug in to the work CUAPB is doing? Anger, sadness and frustration are appropriate reactions to the horrific injustices that are happening—not just in Ferguson, but in every community. It’s important, though, that we harness those righteous feelings into effective actions that can actually bring change. There are many things to be done and many ways to plug into the work. We hold “train the trainer” classes so people can learn how to teach their neighbors and friends about their rights and how to interact safely with police. People can organize copwatch groups in their neighborhoods. They can help provide advocacy for people dealing with the effects of police brutality. They can plan protests and other political actions to put pressure on the politicians. They can help us get our measure on the ballot to increase police accountability. There are many things people can do, but the most important thing is to pick something and do it. Police brutality is about the most disempowering experience a person can have because when an agent of the state deprives you of your rights and injures your body, you can feel there is no way to fight back. Working collectively with others helps us to regain our dignity and strength. A lot of people are talking about police brutality in other communities right now; but are there any specific issues we are facing here in the Twin Cities? Perhaps the most significant issue is the ending of civilian oversight of police. Three years ago, the city abolished the Civilian Review Authority. While that agency never really had the power to properly address complaints, it was at least somewhat independent and board members were quite vocal about the chief’s lack of discipline on their sustained complaints. Now, the only option you have is to go to the police to complain about the police. This has resulted in hundreds of complaints being virtually ignored and Minneapolis cops having free reign to brutalize people with impunity. At the same time, the legislature passed a law criminalizing so-called false reporting of police brutality, making it extremely dangerous to complain about police. We will never be able to stop police brutality unless the community is able to hold cops accountable for their actions. Is there anything else people should know about your work, or about how we can plug in to that work? Communities United Against Police Brutality is an all-volunteer group. Despite having no staff and little funding, we are highly effective and have achieved many successes for the community—a class action lawsuit that forced Minneapolis to put cameras in their squad cars, a lawsuit that went to the US appeals court and codified the right to videotape police all over this country, multiple lawsuits forcing police to release complaints against officers and other public data, the founding of several neighborhood copwatch groups, and many other successful actions. We can do even more if more people join the effort. We meet every Saturday at 1:30pm at 4200 Cedar Ave, Minneapolis. Get involved! Can you talk at all about the Young People's Freedom & Justice Party? The Young People's Freedom and Justice Party first began as a group that would meet once a week to discuss current issues going on at home and abroad, and look at them with a historical perspective. About a month ago, we proposed the idea of becoming a party—but not like all the other parties that have come before us. Our main goal is eliminating this structural system that is forcing people to stay in the current situations that they are in. We believe that capitalism does more damage than good, that it enforces rich getting richer and the poor getting poorer. There are cases where people have made it out of the personal strife that they were in, but the general population is still affected by this. So our party demands equity. Is there anything people should know about Thursday's action? We want people to bring signs that say “No Justice, No Peace, Prosecute the Police.” We don't want any posters that say “Don't Shoot,” because we don't want people to think that we're victims; we may be victimized, but we're not victims. We also want people to stop expecting teargas and rubber bullets; if they went to the Trayvon Martin rally or Terrence Franklin rally, they’d know that they were quite peaceful, a lot of people came, and I thought they were well done. After Thursday, how can people plug in to your work, or at least stay informed? For now, just be sure to keep checking the event page for Thursday’s event. While NOC works on a variety of issues, they’ve been one of the most dependable, inspiring organizations in the Twin Cities over the last few years. What is NOC doing around issues of police brutality, and how can people plug in to that work? NOC has always been a member led organization, from its inception. Members reach out to us with issues that affect their community and we provide them with the platform and the resources needed to take action. The best way to get looped in to the work that NOC is doing is by becoming a member, so that you yourself can take on an initiative and give back to the community. A dozen or so NOC members have been working on a multitude of different events and rallies in support of Ferguson, "Hands Up Don't Shoot" solidarity gatherings, petitioning military proliferation in local police departments, petitioning under practiced disciplinary action for police officers, and more. There are various movements and campaigns led by NOC members coming to fruition inspired by Ferguson. To get involved with our organizing committee, contact us at info@mnnoc.org. Black Lives Matter Minneapolis: this has emerged as the go-to spot for information on local actions. Coalition for Critical Change: an organization that grew out of the first round of #Ferguson protests and one place to get updated on what happens now. The Committee for Professional Policing: Another local organization (also an arm of CUAPB), their website has contact information and some ideas for getting involved. Twin Cities Save the Kids: Save the Kids (STK) is a grass-roots fully-volunteer organization that is grounded in the values of Hip Hop activism and transformative justice, which advocates for alternatives to, and the end of, incarceration of all youth. Voices for Racial Justice: Since 1993, we have built a stronger movement for racial justice organizing in Minnesota and beyond. Our mission is to advance racial, cultural, social, and economic justice in Minnesota through organizer and leadership training, strategic convenings and campaigns, and research and policy tools. Hope Community Center's SPEAC Program: This is a community organizing training program that isn't explicitly about police violence, but I'm including it here because a lot of the best organizers I know have been through this. Another resource to have on your radar. Socialist Alternative: While SA works on a wide range of issues, they have been consistently vocal about police violence. Link goes to their national org site, but they have an active local branch; contact through the website. Justice for Fong Lee: On July 22, 2006, Hmong teenager Fong Lee was shot and killed by Minneapolis police officer Jason Andersen. The community continues to demand justice for what many see as a police cover-up. Justice for Terrance Franklin: A group dedicated to seeking "justice for the wrongful death of Terrance Franklin at the hands of the Minneapolis police." TakeAction MN: This organization works on a range of issues; this link goes to information on their work around criminal justice reform, including contact info for anyone who wants to get involved. The Dream Defenders with some practical event organizing tips: The Dream Defenders aren’t local, but are “an organization directed by Black & Brown Youth, who confront systemic inequality by building our collective power.” This practical list of questions to ask and things to be intentional about is a must-read. The Dream Defenders with “what do to after your vigil; tips for planning a non-violent civil disobedience:” The follow-up to the last point, this series of tweets is about direct action. Black and Blue: History and Current Manifestations of Policing, Violence and Resistance: Project NIA’s collection of tools, curriculum and resources. Showing Up for Racial Justice’s Police Brutality Action Kit: This toolkit is set up for white people who want to do more, but features ideas for actions, informational resources, videos and more that may be useful to any organizer. A recent article on the limitations of “awareness-raising” and the importance of direct action: Written through the lens of Palestinian solidarity activism, this piece explores how and why some marches and protests don’t go far enough, and what can be done instead. Finally, a note on staying informed: my Twitter feed is overflowing with Ferguson updates and people talking about all this stuff, but yours might not be. While it’s easy to joke about Twitter, it’s been an invaluable resource this month, and I’d definitely encourage checking out the ongoing commentary from people like Elon James White, Dream Defenders, Feminista Jones, PrisonCulture, Syreeta McFadden and Ta-Nehisi Coates, plus locals like Nekima Levy-Pounds, Justin Terrell, and all of the organizations mentioned above. There are a lot of resources and ways to get involved illustrated here, but this is by no means an exhaustive list. Other organizations and individuals are doing this work, and there are always new and creative ways to make an impact. If there are good links and resources that I missed, feel free to leave a comment here. In some sense, our biggest challenge is also our biggest opportunity; with the rise of social media, it’s easier than ever to raise awareness and cultivate outrage around the issues that we care about. Both of these things are good. The challenge/opportunity is to go further, to focus all of that emotional and intellectual energy into concrete, sustainable change. The way to do that is the same as it’s always been: dive in, get involved, and build with one another. Thanks for a great piece. Just an FYI--the Committee for Professional Policing is the political branch of CUAPB promoting our charter amendment to require police to have their own professional liability insurance. Those kinds of campaigns are required by law to have a separate campaign committee, which is why CfPP was set up. This is dope! Thank you for gathering this useful and productive information.